The growth of Freeview is attracting more manufacturers to digital TV products, from set-top boxes to iDTVs and hard drive recorders - also known as personal video recorders (PVRs). TVonics is based in Wales and has its roots in a former Sony project. The company's first digital TV recorder, the DVR- 150, is designed and made in the UK and available at Tesco's. Other products are expected, including one that will earn a new Freeview Playback badge, which should have dual-channel and auto series recording. The DVR-150 may not qualify for that as it cannot record two channels at once. It's not very striking design wise - looking as it does like a generic black case that electronics buffs buy for DIY radio tuners - but it's not too bulky and the build seems robust enough. The outer shell is aluminium with a glossy black finish. It can also be mounted on its side if necessary. TVonics has gone to some effort to make its recorder more environmentally friendly than most. It claims to use about 20W in operation and 3W in standby; quite low for a PVR. It's also said to use more environmentally-friendly materials in its construction. The hard drive is a respectable 160GB, good for about 80 hours of TV recording. Programmes are recorded in the same quality as the original as there is no option to compress recordings to save space). There are two Freeview tuners but, as mentioned, this is only so you can hop to a Freeview channel while recording another, rather than capturing two overlapping programmes. This is a missed opportunity, given that many TVs now have Freeview built in, so the channel hopping ability is less essential. It also lacks a card slot to decode paid-for services. The DVR-150 includes an eight-day EPG for onscreen timer setting at the touch of a button. It has optional subtitle recording and features for playing and managing recordings. The initial tuning is simple and the menus are generally clear and helpful. If you get stuck, there are onscreen Help pages. The green EPG is a rather sickly shade, though it's easy to jump around the schedules to the time or channel you want and pages appear quickly. Listings aren't always available instantly, especially if you skip to later in the week, but data usually arrives in a few seconds. You can set a recording four ways: directly from the current channel, from the Info bar (avoiding the EPG and missing what's on TV now), from the full EPG or with a manual date-and-time setting (for going beyond the eight-day EPG, up to 12 months ahead). It's as flexible as Sky except the lack of twin-channel and automatic series recording. There are daily and weekly options for regular recordings in the same timeslot and automatic timer padding for adding 1-10 mins to the start or end of recordings. If two recordings occur back-to-back, it disregards padding so you miss the start of the second. The handset is clearly inspired by the Sky version and that's a design classic, so we have no complaints. Playback options include slow motion and three fast forward/reverse speeds up to 128x for churning through long recordings. You can also jump to the end or start with one button push. The Library page tells you how many hours the recordings total, what's reserved for upcoming timers and what's spare. You can also sort the library into A-Z order, by the shortest first, viewed/unviewed or by recorded date. Disk management includes a playlist for backing up batches of programmes to tape or DVD and an automatic delete option where you can say which kind of titles, if any, are removed if the disk fills up. We found a few glitches, notably that it crashed when left alone for a few days, leading to several recordings failing. Another glitch came with the RGB video output via Scart - normally the highest quality output if there are no component or HDMI sockets (as here). Two different samples failed to work properly in RGB with our Panasonic plasma TV, resulting in a pale, bleached-out image (the S-video alternative is fine). This did not happen with an LG LCD, however, so this could be a limited compatibility issue. Also, the recorder is quite unstable when resuming normal speed playback after fast searching, with picture and sound breaking up for a few seconds. Those issues aside, it's a decent performer for general picture quality. Freeview broadcasts can vary enormously, but at their best the colour and detail can be very good. This PVR is well up to standard for both live viewing and recordings, with a flair for picture sharpness, high contrast and accurate skin tones in particular. Compressed digital TV audio can be rather low-fi and scratchy, but this is a fair receiver for your TV sound and digital radio stations. These stations are kept separate from the TV channels but can be found with the handset's DTV/Radio button along with full EPG information and the convenient ability to be able to record radio as well as TV. Overall, this is not the cheapest digital TV recorder. You need only pay a bit more to get a hard-drive/ Freeview and DVD recorder combi. We also have some reliability concerns after experiencing the occasional operational glitches with the unit. However, these are quite common with digital TV and overair upgrades can fix bugs and add new functions. 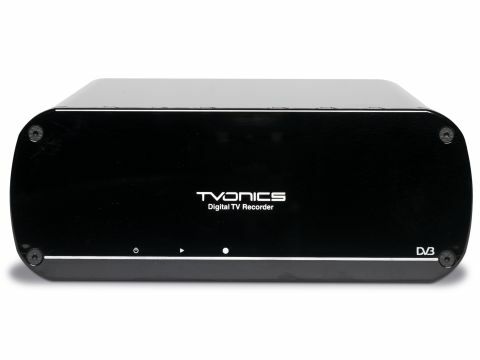 TVonics should be congratulated for making a user-friendly Freeview PVR with an impressive range of features. In future, though, we'd like a nicer-coloured EPG and twinchannel recording.